In case you didn't see the navigation at the top of the screen, here are some shortcuts for you! Index: 1. What Makes Krav Maga Different? 2. How Do I Get Started? 3. Where Are You Located? 4. Am I Too Old / Out Of Shape / Inexperienced To Train? 5. How Much Do Classes Cost? 6. How Often Do I Need To Train? 7. Do You Teach Weapons Defenses? Q: What makes Krav Maga different than other fighting systems? A: Krav Maga itself is a Mixed Martial Art (MMA), literally a mix of different martial arts. Originally based on Boxing, Judo, and Wrestling, eventually it incorporated parts of Muay Thai and Jiu Jitsu as well. So, in many ways the actual fighting we do is not THAT different, however, what is different is the mindset and intent. Many other fighting systems train with a competition mindset, or perhaps a mindset that focuses on the "art" aspect of the fighting. Krav practitioners don't train for a 3 round 1-on-1 match - they train for violence that happens in much scarier circumstances that take place in 15 seconds, not 15 minutes. Multiple attackers, weapons, crazy people, drugged out attackers, sexual assault, situational dangers, huge size differences, gender differences, hate-driven assault. This stuff makes fighting a much more hectic and terrifying experience, that's Krav Maga's focus, that's Evolve's focus. Fighting that is dependable to work in the most stressful event of your life. OR if you want to come just watch a class first, that's fine too! Just send us an email or text letting us know you're coming! Q: Am I Too Out Of Shape / Old / Inexperienced / Etc. To Train? A: Nope! 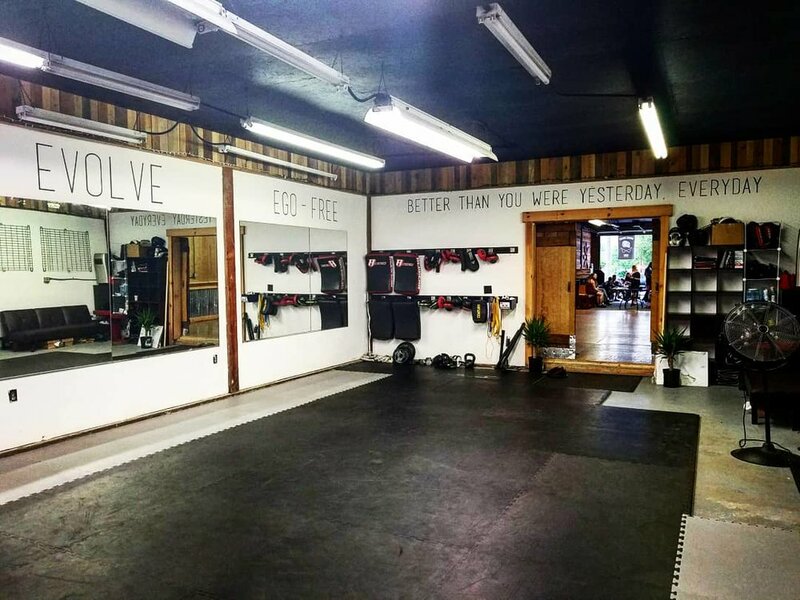 One of Evolve's top goals is making self-defense accessible to anyone and everyone, since it's not just athletes that need to defend themselves obviously. The first way we do this is through a practical approach to Krav Maga that prioritizes teaching fighting that anyone can learn and use against any opponent (ie. no double-spinning backflip kicks). We teach things that are widely applicable, dependable, and have high effectiveness rates since not everyone will be bigger and better than the bad guy. The other way we make fighting accessible is by sticking with an idea that is "Challenge By Choice". This means that we will challenge you in ways and provide structure, guidance, and encouragement for your growth and development, but in the end it's up to you to challenge yourself. To achieve this, we provide "open challenge" in as many ways as we can. For instance, we may say "Non-stop punches, go!" for a conditioning drill, rather than saying "50 punches non-stop!". This way, those who can pump out 100 punches will challenge themselves and do that, those who can only manage 20 will challenge themselves there. Obviously, classes are still difficult but if you're willing to challenge yourself and you can communicate with the instructor, you'll be set! A: Evolve offers a variety of ways to train (Group Classes, Seminars, Private Training, Events) and a variety of membership options depending on the needs of each member. We often start new students off with a trial (CLICK HERE) so that they can try out the classes and see that Evolve is the best fit for them. After this, new students will sit down with an instructor and decide which training path fits their needs best and continue from there. A: Evolve has no required minimum number of classes that you must participate in. However, if you really want to improve your fighting and get these skills in your muscle memory, we suggest coming at least twice a week and more if you really care about making these skills a part of you. Just like anything else, the more often you come, the quicker you'll progress and the more you will retain. Q: Do You Teach Weapons Defenses? A: Yes we do, however, it's generally through Weapons Defense Seminars, Private Training, or reserved for higher level students. Weapons Defenses are important to learn, but we take them very seriously so we try not to just throw these techniques out at students when there may not be enough time or attention to nail down the defense effectively. For any other questions, please email contact@evolveselfdefense.com. Emails will be attended to twice weekly on Monday and Friday.